All prices are per person and include required student manual. Classes are conducted at your facility or small classes may be scheduled at my home office. Class lengths are approximate and may vary based on the number of students and practice time. Classes are scheduled upon request! In class, full length classes follow an instructor-led, hands-on class format. These classes are also video-based with real world scenarios that reinforce skills proficiency with an emphasis on high-quality CPR. Class dates/times may be scheduled based on your availability, just contact us! For Medical Professionals. CPR/AED for adult, child and infant as well as barrier breathing device use is taught. environmental (bites, stings, heat/cold related) and injuries (cuts, fractures). Designed to prepare students to provide CPR and use an AED in a safe, timely, and effective manner. The skills learned in this course will help you recognize cardiac arrest, get emergency care on the way quickly, and help the person until more advanced care arrives to take over. 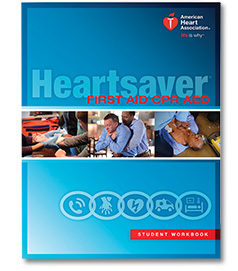 Designed to prepare students to provide first aid, CPR, and use an automated external defibrillator (AED) in a safe, timely, and effective manner. 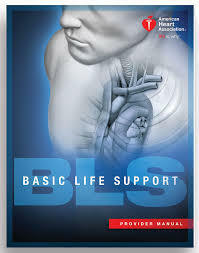 It offers the basics of recognizing and administering first aid for the most common life-threatening emergencies. Covers pediatric specific first aid modules (spotting child abuse, epipens, sunscreen, bandaging injuries, for example) as well as CPR/AED for Children and Infants. This course is for those involved in child care who have a duty to respond to a first aid emergency because of job responsibilities or regulatory requirements, such as child care workers, teachers, foster care workers, camp counselors, youth organizations and coaches for children’s sports organizations. This course is also ideal for parents, grandparents, babysitters and guardians. Adult CPR is an optional element. 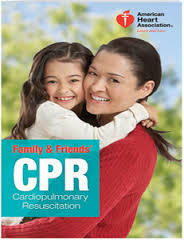 Family & Friends CPR is for people who want to learn CPR but do not need a CPR course completion card to meet a job requirement. This course is ideal for community groups, new parents, grandparents, babysitters, and others interested in learning how to save a life. Class sizes may be larger.